The rain sensor is behind the driving mirror in contact with the windscreen and has the purpose of automatically adjust, during the intermittent operation, the frequency of the windscreen wiper strokes as to the rain intensity. The sensor has a range of adjustment that gradually varies between wiper stationary (no wiping) when the windscreen is dry, to wiper at first continuous speed (continuous slow) with heavy rain. Move the right-hand stalk downwards by one position. The activation of the rain sensor is signalled by a control acquisition “stroke”. IMPORTANT Keep clean the glass in the sensor area. Turning the knurled ring (F) it is possible to increase the sensitivity of the rain sensor, obtaining a quicker change from stationary (no wiping) when the windscreen is dry, to first continuous speed (continuous, slow). The increase of the sensitivity of the rain sensor is signalled by a control and acquisition “cycle”. Operating the windscreen washer with the rain sensor activated the normal washing cycle is performed at the end of which the rain sensor resumes its normal automatic function. At the following starting operation (key at MAR), the sensor will not be reactivated even is the stalk is on (B). 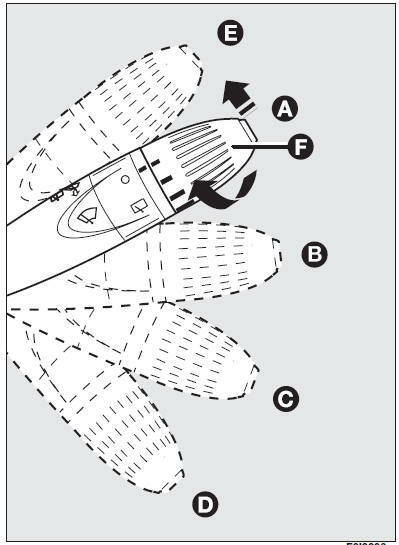 In this event, to activate the rain sensor, you have to move the stalk to (A) or (C) and then again to (B). When the rain sensor is again activated in this way, at least one windscreen wiper stroke occurs, even if the windscreen is dry. difference between day and night. rain sensor when washing the car in an automatic washing station. the windscreen, make sure to have disconnected the device. off when cleaning the windscreen.